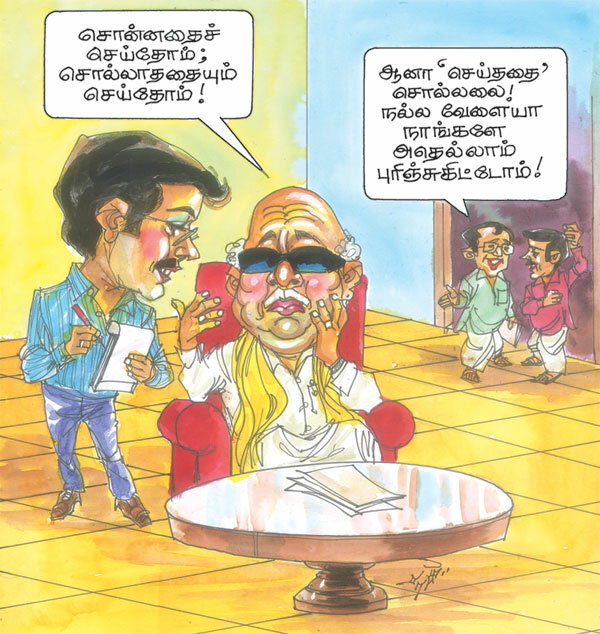 After the defeat of DMK and company in May 2011 elections, the Tamil satire journal Thuglak ran a funny cartoon, where the DMK chief laments "We did what we said, we also did what we did not say (still got defeated)". While the common man chides "Yeah right, but they did not say what they did", refering the 2G spectrum scam. Conveying the meaning not in so many words may not be a Bollywood technique, where heroes and moms dole out tiring breathless dialogs, but is pretty common in speech. Writing or reading between the lines, so to speak. That skill comes in handy in the corporate world whether to blame someone or pass the buck. Sanskritam literature offers a lot of delightful examples in various degrees of "being left unsaid". Anandavardhana, in his masterpiece dhvanyaaloka (11th century CE) classifies it as a "suggestive technique". We shall look at a few instances. One of the most beautiful is from kumaarasambhava, a shloka of which we saw in an earlier post about the penance of Parvati for Shiva. But if you go back and read it again, what is left unsaid in that shloka is equally fascinating. Follow the way the raindrop falls on Parvati and moves about. The described kinetics of the raindrop is possible only if Parvati was sitting in a perfect yogic posture. Kalidasa indeed suggests how Parvati is seated just by describing the movement of a raindrop. Perhaps this was the shloka that inspired Jakanachari shilpi to come up with the masterpiece Darpana-Sundari in Belur. त्रिविक्रम पण्डिताचार्य, whom we referred in an earlier post composed a stuti called hari-vaayu-stuti, where he praises hanumaan (vayu), bhIma, madhvaacaarya and viShNu. It is set in a fascinating meter called srag-dharaa ("worn as a garland") with 21 syllables per paada. That makes 21x4 = 84 syllables per shloka, with a total of 41 shlokas! (The same in anuShTubh meter would have had 84*41/32 = 108 shlokas!). Sri Madhvaacaarya said that a stuti must begin with a praise to hari and instantly composed two shloka-s (some say it is just one) praising just the nails of narasimha (narasimha-nakha-stuti). These shlokas are recited at the beginning and end of hari-vaayu-stuti. But the beauty of these shloka-s also lies in what he did not directly say. The narasimha-nakha-stuti is in two different meters - a rare instance in Sanskritam literature. The first two paada-s are in a meter called "shaardUla vikrIDitam" (= play of a Lion) and the second two paada-s are in srag-dharaa, the same as that of hari-vaayu-stuti. So he also conveys the story of narasimha avatara - play of a Lion and wearing of a garland (hiraNyakashipu) - just by selecting the aptly named Chandas. Beginner Sanskritam students can recognize the question form "kim etat bhavata:? - Is this yours?". Obviously there are many more such fascinating examples in the gamut of Sanskritam literature.